Pork chops come in a variety of cuts and sizes, much like beef steaks. All pork chops come from the loin of the animal, which runs from the shoulder to the hip. Get some tips on cooking pork chops and find new pork chop recipes. Pork is a versatile meat that can take on plenty of flavors and still remain a staple in your diet. It is a relatively healthy, lean meat. Many of us enjoy pork chops regularly, but adding some new spices and cooking techniques to our cooking routine can give you some unforgettable recipes. Shoulder chops come from the shoulder area. They might be called blade chops, blade end chops or pork loin blade chops. Though they are fattier and bonier, they are very flavorful. They are best braised or slow-cooked with liquid. Rib chops come from the rib section of the loin. The rib bone runs along one side of the chop, making them easy to identify. Most boneless pork chops are cut from rib chops. They might also be labeled pork chop end cut or rib cut chops. A relatively high-fat content makes them flavorful and versatile. Rib chops may be grilled, broiled, braised, roasted, or pan-seared. Center-cut chops have a bone that runs near the center, dividing the loin section from the slightly smaller tenderloin section. They might also be labeled top loin chops or loin chops. The flavor is mild, and the chops do well grilled, broiled and pan-seared. They can become tough if overcooked, so they are not the best choice for slow cooking. Sirloin chops are cut from the sirloin, or hip area, of the animal. They are generally tough and lacking in flavor. They might also be labeled sirloin steak. Use this cut in the slow cooker, long or slow braises, or in stews. Apple Stuffed Pork Chops: These chops get stuffed with apple goodness and create a hit. Cornbread Stuffed Pork Chops: Combine cornbread with the delicious savory taste of pork chops. Easy Oven-Barbecued Pork Chops: Why not add barbecue seasonings to pork chops. Easy Pan-Grilled Pork Chops with Spicy Rub: if you like things hot, this recipe spices things up. Pecan-Stuffed Pork Chops: Stuff pork chops with pecans for a signature nutty flavor. 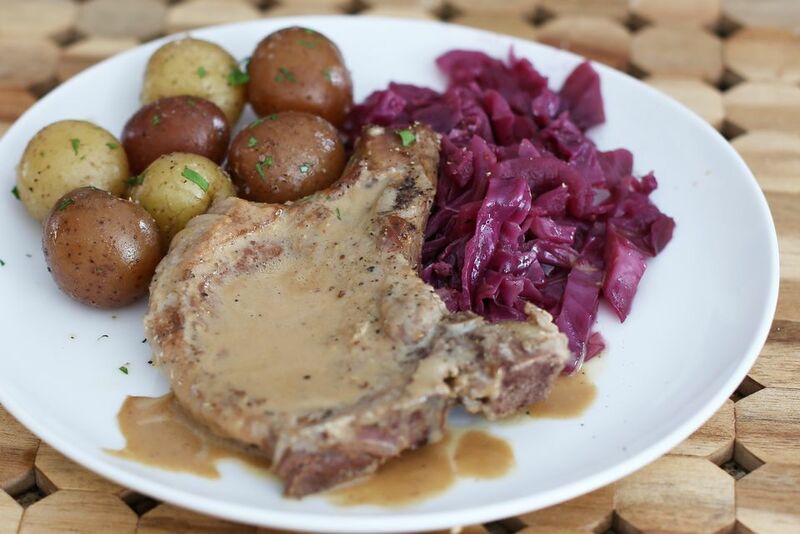 Pork Chops Alabama: A pork chop recipe inspired by the great state of Alabama. Pork Chops with Bacon and Wine: Bacon, wine, and pork chops...together in one great meal.